‘Meditations have been so elevating.’ | Realise the World! The Coolcheck Tour has been amazing. It felt like on India Tours. We have been so well looked after by the various collectives we stopped by. Open hearts and hospitality kept welcoming around 50 of us at every stop and miracle moments were manifesting regularly. Meditations have been so elevating. We estimate that over 400 seekers received their Self Realisation however many other seekers took information about the Coolcheck and Sahaja Yoga along with the details of local programs. For instance, Aunty Carol, local resident from Byron Bay not practicing Sahaja Yoga at the time, helped us to book us for the Byron Bay markets. She had to go on the Coolcheck website to be able to talk about it when she would lodge the application form in person. She said that she had a beautiful meditation online and after meeting us she encouraged all the young people boarding at her house to also go online. She now wants to bring the Coolcheck to New Zealand as she is moving there soon. 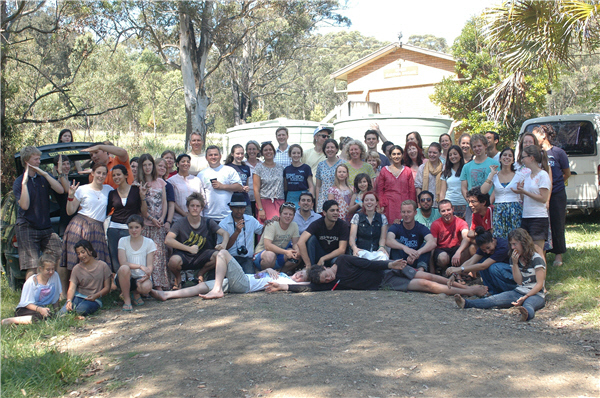 The trip had been rather long and some wanted to go home on their arrival back in Sydney before going to the 9 days Yuva camp to wash their clothes but once they arrived in Sydney most of them decided to stay together and continue their adventure in the camp at the Sahaja Yoga country property in Balmoral Village NSW. We would like to thank all the Queensland and New South Wales collectives who have welcomed us with such an open heart, all the Yuvas from all around Australia and overseas who have spread Sahaja Yoga and such nice vibrations on the East Coast of Australia, all the Uncles and Aunties for their loving care and support, and most importantly Shri Mataji for organising everything so beautifully for our ascent and enjoyment. Thank you very much for the detailed report. Sitting in India, we were able to know all details about your enthusiasm and love to spread the Divine Message. Our best wishes are to you all.